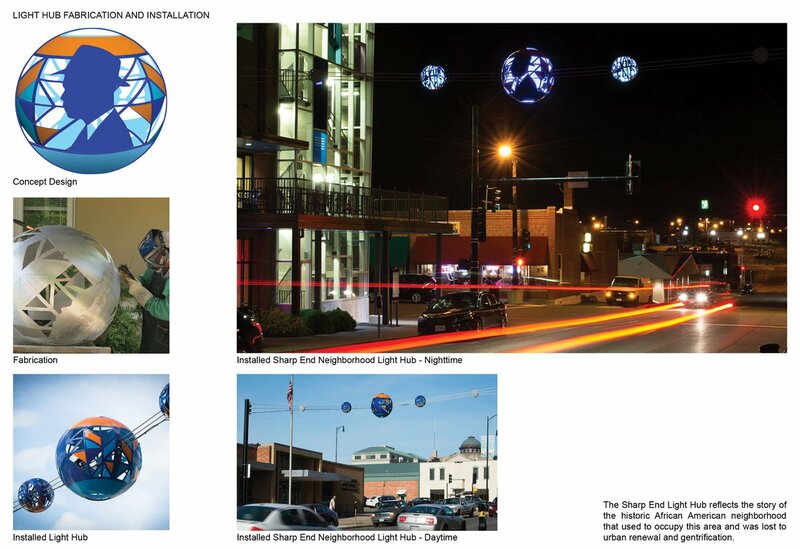 The Light Hubs were the first phase of implementation of The District Gateways Master Plan, for Downtown Columbia, MO. The Master Plan was developed to give identity to the Downtown, enhance wayfinding, and foster economic development for the area. Due to the fact of being surrounded by 3 colleges, with their own respective mega blocks, the Downtown was difficult to access. The master plan achieved consensus on the overall vision through sound analysis and extensive community engagement. -North Village Arts District Light Hub, showcases the art and creativity of the innovation and artist village on the north edge of Downtown. The master plan and first phase Light Hubs Project has given new identity to Downtown Columbia. For years merchants and institutions have struggled to direct visitors to downtown, they now have a plan. In December of 2017, The District and the City of Columbia, signed a Memorandum of Understanding (MOU) to collaborate on the final design and construction of the Columbia Gateway Plaza, as the main infrastructure project to be built as part of the City’s Bi-Centennial Celebration in 2021.